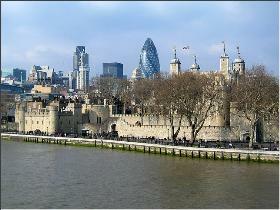 The Tower of London was founded by William I immediately after the Norman Conquest in 1066. 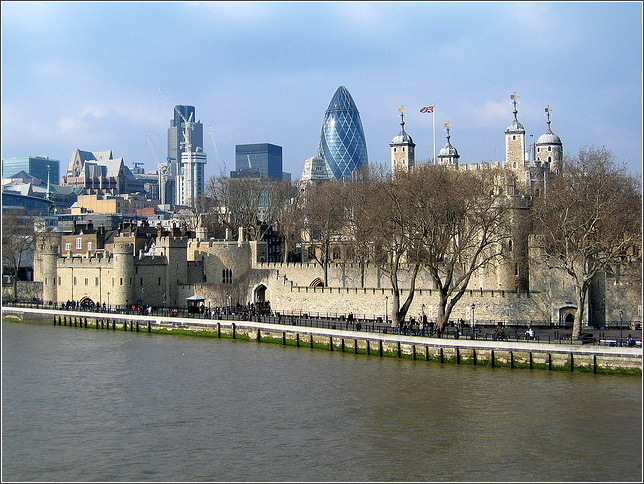 It was strategically sited in the south-east angle of the Roman city wall, just downstream from Old London Bridge, commanding open countryside to the east, the Thames and the bridge to the south, and the city to the north and west. By the end of the 13th century the outer wall enclosed an area of around 7 ha, which is roughly the present size of the castle. 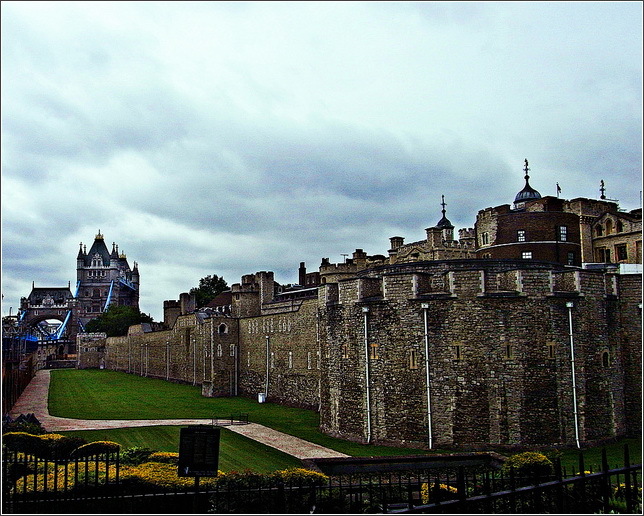 The Tower of London is one of the most important landmarks of England’s capital. In London on Christmas Day in the year 1066, William, Duke of Normandy, was crowned King of England. William wanted power. He began building castles everywhere in his kingdom, especially in the main city of London. Twelve years later, in 1078, William ordered one castle replaced with a great stone stronghold. 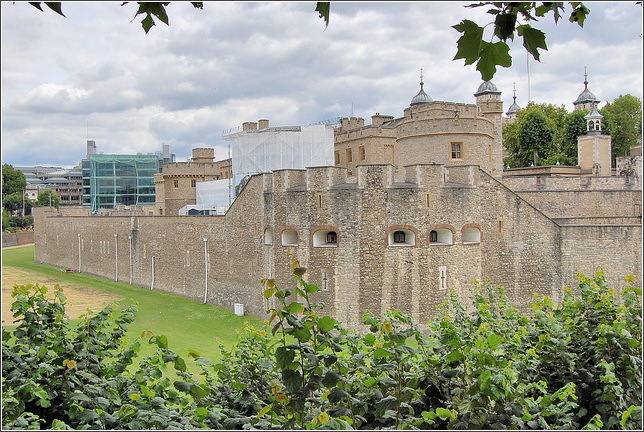 This fort stood in the southeastern corner of London. The castle was huge. It became a symbol of William's power. It was a fortress for his defense, a palace in which to live, and a prison for his enemies. 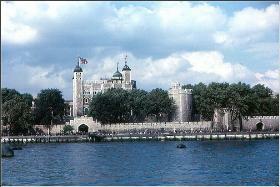 It was named the Tower of London. The first structure built within the castle was the keep. A "keep" is the strongest and most secure tower. The first keep was called the White Tower. The Tower was finished twenty years later during the reign of William Rufus, William's third son. It was nearly 100 feet tall with walls fifteen feet thick. The Tower contained a chapel, apartments, guardrooms, and crypts (underground burial chambers). It was surrounded and protected by a wide ditch, a new stone wall, an old Roman wall, and the Thames River. Rannulf Flambard was the Tower's first important prisoner. King Henry I dragged Rannulf, the fat and greedy Bishop, along with his servants and bags of money, to the Tower. Henry wanted him to suffer. However, Rannulf had lots of money, so he bribed his captors with gold and lived quite well in the Tower. One night in February 1101, Rannulf threw a party. After the guards became quite drunk, he sneaked out a window and slid down a rope outside an outer wall to freedom. The Tower remained a fortress-prison until 1240. King Henry III had the Tower whitewashed. It soon was transformed into a dazzling royal palace. He added a ring of eleven towers around the White Tower. He also added more grounds and included a church, a great hall, and other buildings. Another interesting structure King Henry added was a zoo to house three leopards, a polar bear, and an elephant. The animals were all gifts he received while he was king. 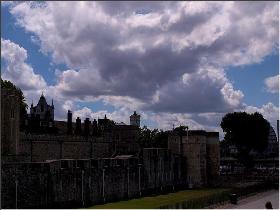 The Tower of London continued to grow and expand with the reign of the different kings. It served as a royal residence and fortress until 1547. 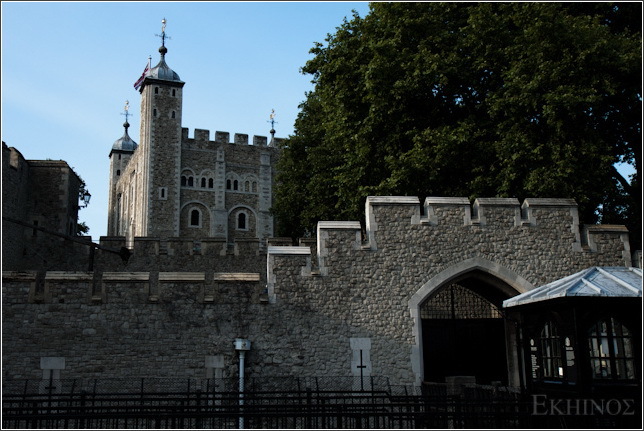 Other uses for the Tower over the centuries included a Royal Mint until 1807, a public records office until the mid-1800s, a national arsenal for storing weapons, and a safe for the Crown Jewels since 1303. If the stones of the Tower's many walls could talk, what stories they could tell! 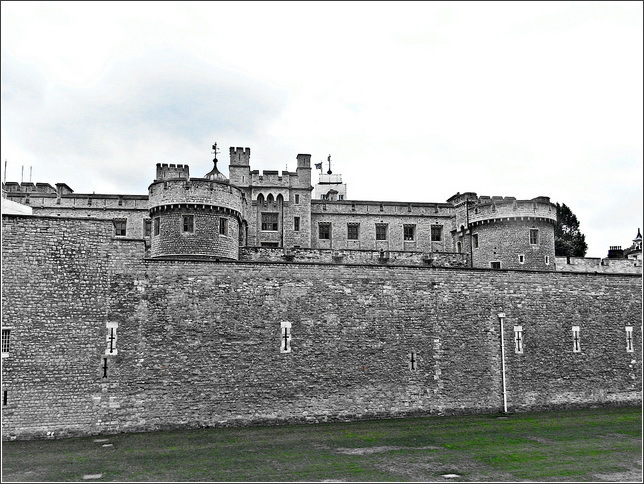 Within the first 900 years of its existence, the Tower of London was the scene for many gruesome executions and deaths. Several English rulers met with unfortunate deaths in the Tower. One king, named Richard II, was only ten years old when he became King of England. When he was fourteen, a group of overtaxed farmers stormed the Tower. This revolt became known as the Peasants' Revolt. Although Richard was safely hidden, other royal leaders were not so lucky and lost their lives after being captured. Many years later Richard was thrown into a Tower dungeon. 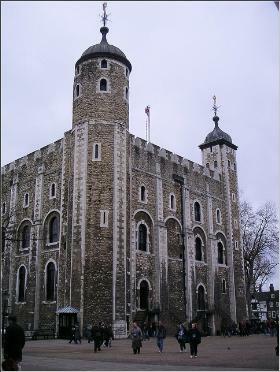 He became the first English King prisoner in the Tower. 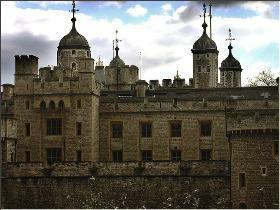 Some famous prisoners who died in the Tower were guilty of interesting crimes. Read about some of their crimes below and what happened to them. What do you think would happen to these people today? 1441--Eleanor, Duchess of Gloucester, wife of the King's uncle Humphry. She was charged and killed for trying to kill the king by melting a wax image of him before a fire. 1483--Edward V and Richard, Duke of York. These two young princes were the sons of King Edward IV. When King Edward died, their uncle Richard, Duke of Gloucester, wanted to become king. However, the boys were next in line for the throne. Richard plotted to take the throne for himself. He probably had the boys murdered in the Garden Tower. This tower is today known as the Bloody Tower. 1535 - Ann Boleyn. She was King Henry VIII's second wife. She was charged with being unfaithful to her husband and was beheaded. However, her real crime was giving birth to a daughter rather than a son, a future king of England. 1618 - Sir Walter Raleigh. He was an explorer known for his expeditions to the Americas. He lost his head after he failed to find gold in South America and returned empty-handed. 1941 - Rudolf Hess. This German spy was the last prisoner to stay at the Tower of London. He was Deputy Fuhrer of Nazi Germany during World War II and was held captive and executed in May 1941. 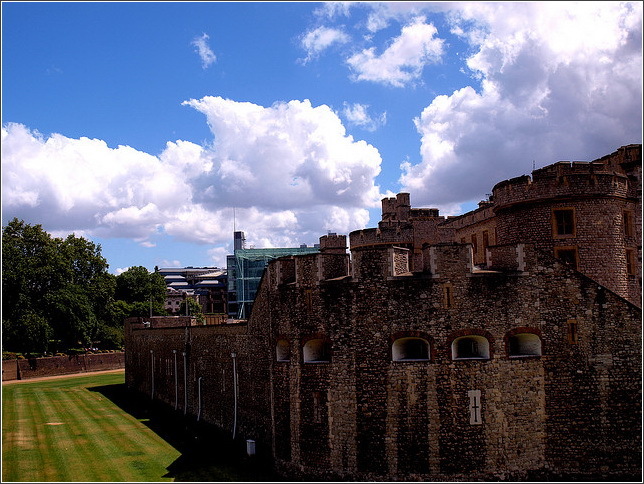 Since the foundations for the Tower were laid in 1078, there have been men appointed to guard the prisoners and attend the gates. Today men still serve as keepers of security for the Tower. They are called Yeoman Warders. 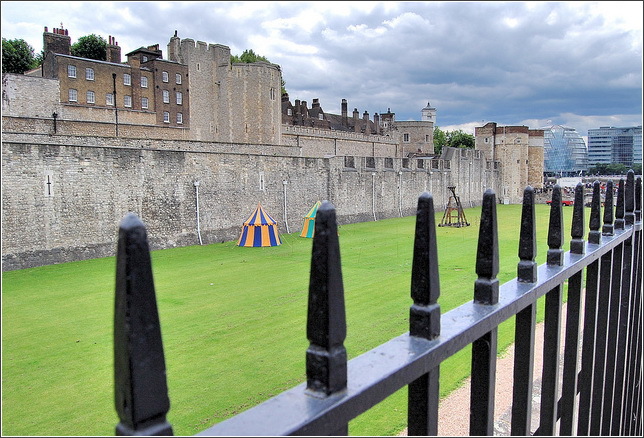 The Yeoman Warders originated during the reign of King Henry VII. These men still wear the costumes of that period. Their striking outfits include a red tunic with purple and gold lace trim, red knee breeches and red stockings, a ruff, a plumed hat, a steel gilt spear and battle ax with a red-and-gold tassel, and an ornamental sword. Today there are thirty-eight established Yeoman Warder posts. They are recruited from the Royal Marines, the Army, and the Royal Air Force. These men are responsible for the security of the Tower and its visitors. They conduct public guided tours of the Tower during the day. Each evening, a Ceremony of the Keys is held. The outer gates of the fortress are locked and the keys taken to the Resident Governor. All Yeoman Warders are required to live on the grounds of the Tower with their families. They live in private houses. Each evening, after the gates are locked, the Tower becomes a separate, safe community for its permanent residents. The Tower of London was one of the main treasuries for early English kings. It became home to many of the Crown Jewels. In 1868, a tower named Wakefield Tower was remodeled to display the Crown Jewels. The value of all the gold, silver, platinum, diamonds, sapphires, rubies, emeralds, and pearls in the royal collection is priceless. It would be difficult to find anything in the world that might compare with the British Crown Jewels. A highlight of this magnificent collection is the Scepter with Cross, which includes the largest cut diamond in the world. It is the 530-carat First Star of Africa. The Imperial State Crown is also on display in the Jewel House. It includes 2,868 diamonds, 273 pearls, 17 sapphires, 11 emeralds, and 5 rubies. Imagine all those gems sitting on top of your head! There has been only one attempt to steal this incredible collection of Royal Treasures. In the 1600s, a man named Thomas Blood disguised himself as a parson, or preacher. A woman he claimed was his wife came with him. Together they visited the Martin Tower, where the royal jewels were on display at the time. As the Master of the Jewel House opened the door to the jewel chamber, Blood struck him on the head with a mallet. Blood and his accomplices hurried to collect some treasures. However, the plan was foiled when the nephew to the Master of the Jewel House unexpectedly appeared. The thieves fled, but were caught later as they tried to get out of the Tower. 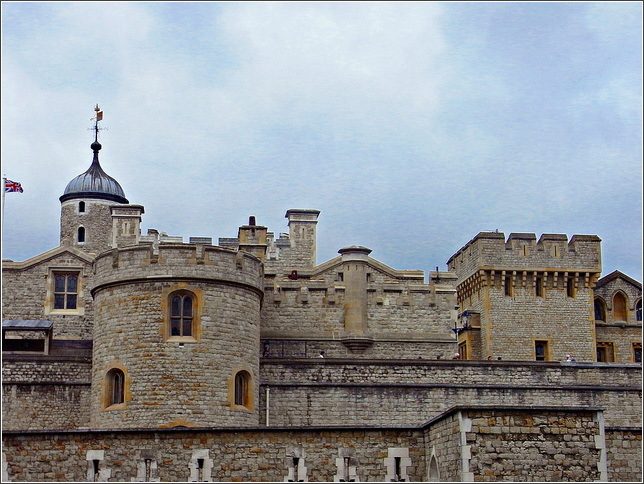 By tradition, there have been ravens at the Tower of London for many centuries. The ravens are protected by an old legend which says that should the ravens ever leave the Tower of London, the White Tower will crumble and a great disaster shall befall England. 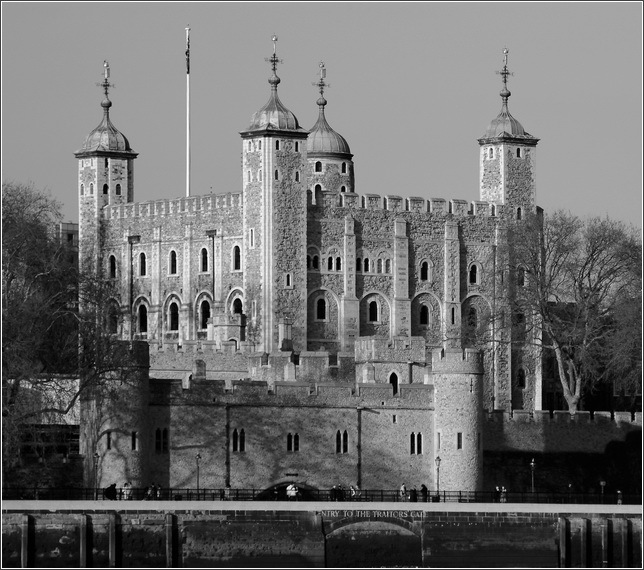 Strangely, the only recorded time there were no ravens at the Tower was in 1946. At that time, World War II had just ended, and England had come very close to falling. Do you think there is truth to the legend? There are six main resident ravens at the Tower plus two alternate ravens. They live in nesting boxes in the Tower grounds near the Wakefield Tower. They are cared for by one of the Yeoman Warders, called The Ravenmaster. This is a very important Yeoman Warder position. Ravens are similar in appearance to the common crow. The wings of the Tower's ravens are clipped so they cannot fly away. Ravens live an average of twenty-five years. If one dies, a young raven replaces it. The ravens can be seen at four areas within the Tower of London. 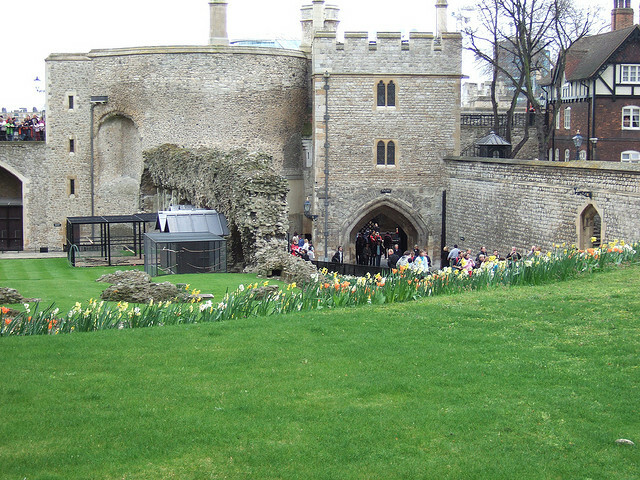 One area is called the Tower Green. This is an old execution site. Ravens of the time would have witnessed the executions of Ann Boleyn, Walter Raleigh, and many other prisoners. The oldest valentine dates from 1415 when Charles, the Duke of Orleans, wrote to his wife from the Tower of London. It is currently located in the British Museum. The Royal Armories have an impressive collection of Tudor arms and armor. 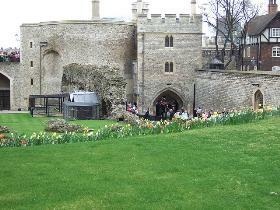 There was a zoo inside the Tower of London for over 600 years. 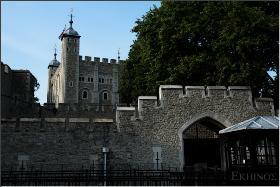 To enter the Tower of London by night you need a password that changes every 24 hour. Useful info about how to reach the Tower of London can be found on the official website page getting here.